I really don't care for fly tying. I don't do a ton of it, but there are a handful of patterns that I've become pretty competent at lashing together, and have become the core of my fly box. Tying really is somewhat of a necessary evil...sure I could buy flies, but I've accumulated so many hooks, hackles, beads, and thread over the past few years, it'd be a shame to have them go to waste. One commodity I haven't acquired to date, but am kinda intrigued by is UV resin...you know, the epoxy-like stuff that gets hard really fast (without help from special pills) when you shine a special flashlight on it. I'd like to get my hands on some, especially since I'm starting to tinker with saltwater flies, but I'm not sure where to sink my $20 or $30 (before UV flashlight, of course). I guess the market leader is Clear Cure Goo (CCG)... It seems to be the brand that most people would recognize when it comes to this stuff...as well as the one most commonly referenced by the fly tyers I follow on social media. It comes in a lot of different flavors, and with all the "love" out there, I guess it can't be a bad product. Or maybe they just have a lot of tyers on their Pro Staff. 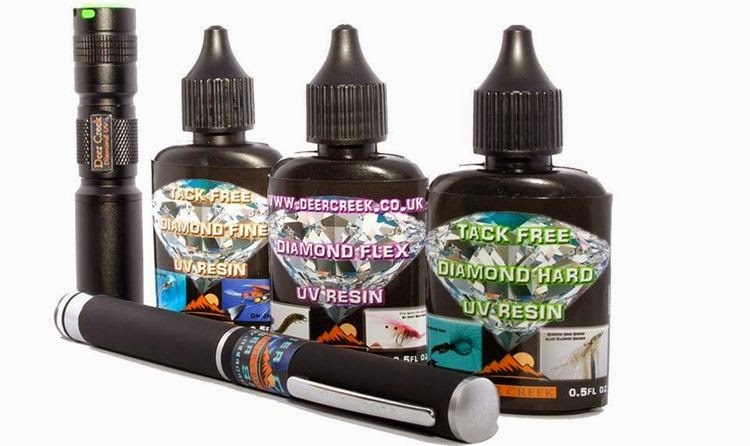 Then sort of in the last year I've read some folks really raving about Deer Creek Diamond UV resins, which are pretty much the same thing (I guess? ), except they've always been "tack free." (Evidently the original recipes of CCG dried tacky and needed a topcoat). I don't know a ton about Deer Creek Diamond other than I think it comes from the UK, so perhaps that's why it's not as common as CCG. I also understand there are a slew of other choices...Loon, Solarez, Jif, etc...so I was wondering what you all might be using and if there's a reason why? POSTSCRIPT: Cheech over at Fly Fish Food just posted an entry about UV Resins today as well. Coincidence? (Probably, I'm not vain enough to think it's some sort of retort to my post). I'll add the link to go read his post HERE as the commentary over there will probably contribute to this conversation too. 1) Loon's light seams to be the most economical from a size, power and cost perspective. One LED, one AA battery and a small size. I pack it when fishing for wader repairs or if I want to us their Knot Sense product on my leaders. Only downside is a fresh battery is needed probably more frequently than with the LED array from clear goo. 2) The Loon UV thick does cure tacky so a coating of head cement or UV flow is needed. Also, if your trying to epoxy materials to the hook, the thick doesn't soak in. 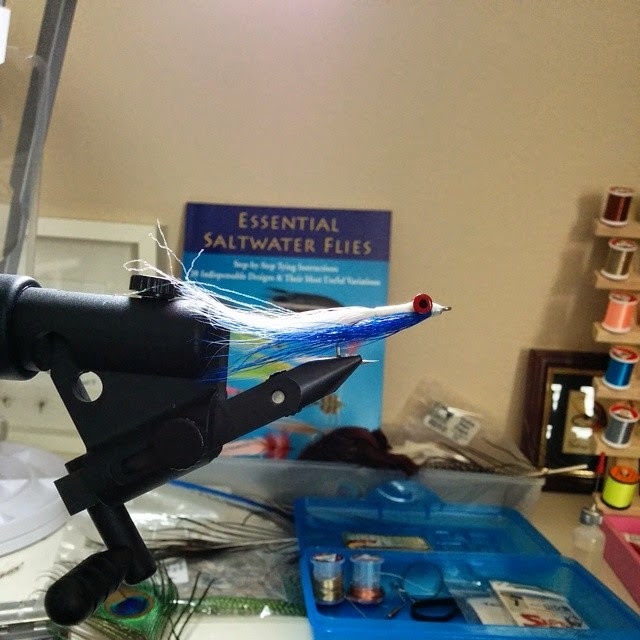 I've found that using first flow, then thick or thin and finish with flow is the best approach for finishing heads on salt flies. 3) This is probably true for all epoxies, both UV and standard, but if your eyes or fly head has too much wax from the thread or other foreign material, the cured epoxy can come off just like a cast mold. I haven't used any of the other UV resins so I can't compare performance. Hope the helps. The nice thing about UV over traditional epoxy is you don't need a drying wheel for your flies. R.I.P. drying wheel! Sounds like the Loon is a solid choice (no pun intended). I got the Clear Cure Goo (I think) at a fly show a while back to tie some fly, but have never used it. Can't remember what fly it was now. Probably no good any more, but I still have the blue light. Maybe my dentist could use the light. Goo is the Poo, but I still use Loon products because that's what I've got. I don't see a lot of difference between the two. I think the trick is to go easy and keep your hands off the fly for a few minutes. The CCG should still be good unless it's been exposed to UV light. I don't think the stuff ever goes bad. I've got CCG. Got it on recommendation from Cheech (Before they started using Loon). It's fine, but I don't like that the Thick and Thin cure tacky and require a coat of Hydro/head cement. I dislike having to add an extra step in the process. I also don't like the syringes that the thick and thin come in. They are hard for me to use to get the goo where I want it and only where I want it. I've tried squirting a bit onto something else and using a bodkin to apply it which works fine, but I always end up squirting out more than I use and making a mess. For me the only reason to use CCG is if you need the wide variety of goos they offer. I haven't tried the tack free versions yet, but their website says those should only be used in thin coats for best curing, kind of defeating the purpose again. If I have the cash when I run out of my current CCG I want to try the Diamond Hard since all of their resins are supposed to be tack free once cured. A part of me wonders though the tack freeness has more to do with the extra UV Intensity from the laser instead of from an LED flashlight. They also have applicator bottles like Loon. Thanks for the thorough reply. Lots of good info there. I think I'm going to try the Deer Creek based on a lot of the responses. I've been having some fun with my new $8 UV flashlight and Loon's UV Clear Fly Finish Flow... It worked great. As I'm a novice at this application, I cannot tell you what brand is the best. But, don't put a bunch of money into that flashlight. You can get them cheap at a local hardware store. Or at a tackle shop... believe it or not. I have been using CCG products for a while. They work great as an alternative to head cement or to build a head/body on a fly. They do NOT substitute for epoxy for flies like a coffee bean beetle, since they have little or no adhesive properties - goo does not stick 2 surfaces together. Oh well...thanks for the heads up on the drawback. A Princeton Mota - I'm gonna try the Loon Outdoors one next. I'm almost out of CCG and i'm looking for a faster cure. Rob Gonzalez - I've used CCG for awhile now, mostly Hydro but as soon as my stock is gone I'm changing to Deer Creek. CCG & Loon both require a topcoat whereas Deer Creek really is tack free and doesn't require the massive UV light - instead it's more of a penlight size. All that UV around your eyes is one of the worst parts about these resins. Look away while setting them to be safe. Deer Creek resins along with many of their other cool products (like Gliss 'n Glint) are available from Casters Fly Shop here in the states. Aileen Lane - i used to use CCG, but was introduced to Deer Creek and have been very happy! Dries in seconds and truly tack free. Cody Martin - Loon is the best in my opinion. I have been using CCG for quite awhile now, and I use it a lot for baitfish patterns for bass and musky. I cannot tell you how it compares to other products out there, because, I haven't used any of it, yet. I like the CCG, I actually do not mind the syringes. It's probably, because, I got used to them. I also, do not mind that there are 3 steps needed to build a head on bigger flies. Thin - Thick - Hydro. I'm in no rush when I'm tying. I am curious about the Loon Outdoors line of products. One thing that really stands out to me about their stuff, is you're able to add color to the stuff by mixing it, and then you're able to use it. Interesting about the Loon. I like the color mixing idea. I've been wanting to try Clear Cure Goo for awhile. I actually almost bought some at the fly show but never pulled the trigger. Well a lot of feedback to base your purchase decision on. I'm going to pick up a bottle this weekend.